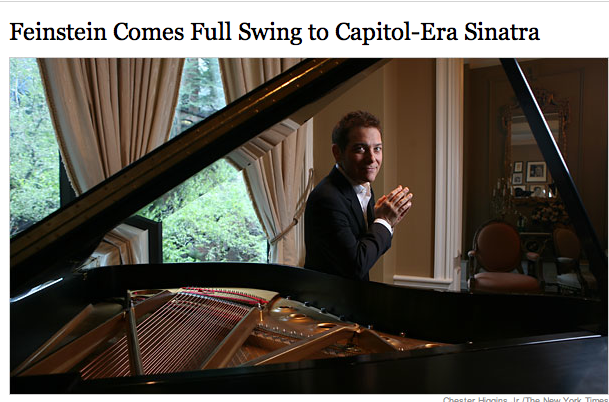 Musical archaeologist, entertainer and historian Michael Feinstein is set to release his 24th album. But this time he has focused his considerable efforts on music by Frank Sinatra. I’m not usually a fan of Mr. Feinstein’s, but if the advance review is to be believed, this one is destined for my CD rack. Even if his phrasing doesn’t hold a candle to Ol’ Blue Eyes’, the results are sure to be spot on. Mr. Feinstein is, after all, a former protégé of Ira Gershwin, and is a most educated enthusiast of the period and its music. In his defence, Mr. Feinstein has done more to preserve the traditions, music and lore of the Great American Songbook that I love so well than even Bobby Short. And, in these waning days of true all-around caberet entertainers, he is a hold out; a link to an age of supper clubs, dancing cheek-to-cheek and sly double entendres couched in very pleasing melodies. So, set ’em up Joe. He’s got a little story that you oughtta know. This entry was posted in Cultivating and tagged Frank Sinatra, Great American Songbook, Michael Feinstein, New York Times. Bookmark the permalink. 4 Responses to To Be Perfectly Frank. I read about this. It looks like it will be brilliant! Years ago I saw Feinstein open for (ahem) Liza Minnelli in Stamford, CT. I hope so Fairfax. I’m willing to take a flyer on it. LBT, welcome back to the world! I saw him in concert here in Richmond. He was just too polished or stiff or something for my taste. I hope he lets in a little “ring-a-ding-ding” on this one. I’ve had a chance to listen to the new album on iTunes now. He’s got a flair for the Cole Porter stuff especially. Thanks for the pointer!